The girls’ room is coming along. Slowly but steady. Nathan is doing most of the painting after he gets home from work. And he has been staying up really late to finish things up. Isn’t he the greatest? We are all ready for all this to be over with but still have a long ways to go. We are living in total chaos with stuff everywhere. At least when we finish painting the walls, we can set up the girls’ new bunk bed and have them sleep in the room while we finish the decorating. To see the room completely finished painting, see this post. First of all… Majority of the paint in this room was provided by Behr as they sponsored this painting project of the girls’ bedroom. 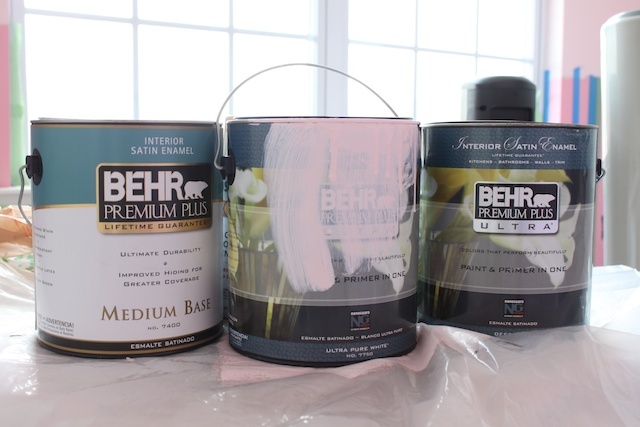 Nathan and I are in love with Behr’s Premium Plus Ultra paints. It’s primer and paint in one. It is slightly more costly (about $30/gallon at Home Depot), but saves you money and time in the long run. We used less coats which also meant less painting time by using the Ultra paint. It coats so well and the colors are flawless. For this room, I used several of their new 2011 Color & Design Trends colors. To see the specific colors I used, visit this post. And as far as tape goes, we used a ton of tape, but still not as much as we thought we would have to use considering we taped over 100 stripes. For taping the trimming, baseboards, ceiling and around the windows we used regular painter’s tape. 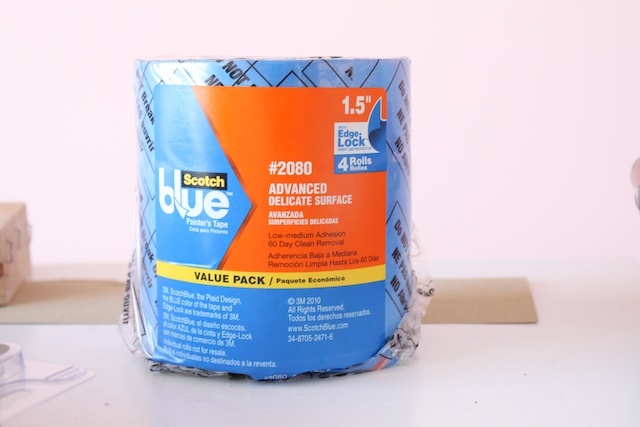 But for the stripes, we used Scotch’s new Edge Lock Blue Painter’s tape. It worked wonders. All 100+ stripes came out clean. 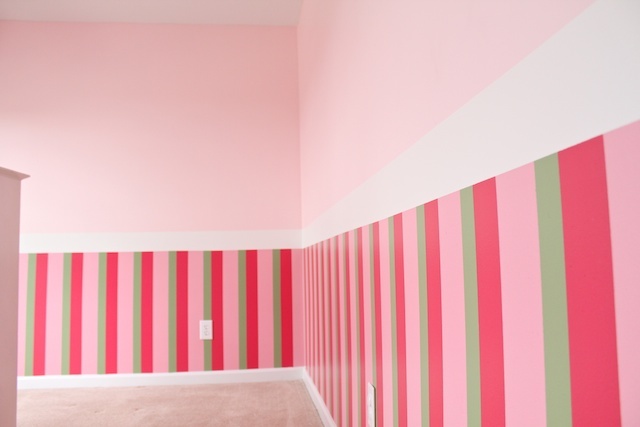 And you may be surprised to know that we used only 2 1/2 rolls for that many stripes in the room. 1. So you have your three colors selected. 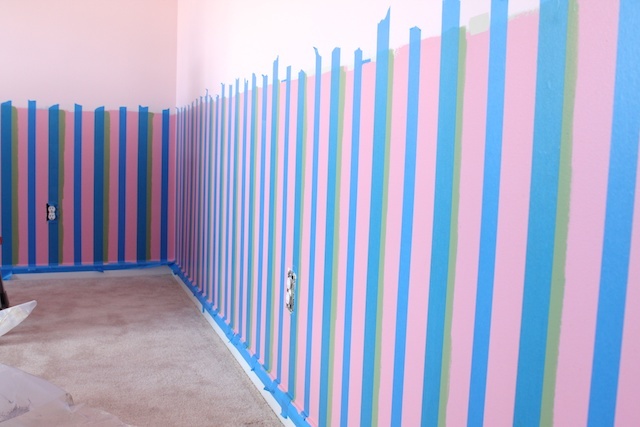 Color the entire wall or the area where you’ll have three stripes the lightest color. That’s your base. First color done. 2. 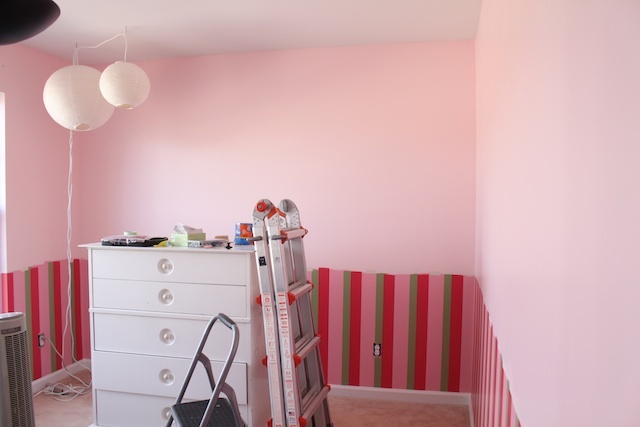 Once the light pink is on and completely dried, you tape only the left side of the next color. In our case, we did green. When you paint the second color overlap it a little, like by an inch. The overlap will be covered by the third color stripe that will be on the right side of the second color. Peel off the tape once the second color is done. 3. Once the second color has completely dried, tape the right and left side lines of the third color. In our case, we did dark pink. Inside where the third color will be there’s the slight overlap of the second color. The bottom picture looks like there are only two colors and that’s because the green was completely covered by the 2-inch tape. Peel off the tape once the third color is done. 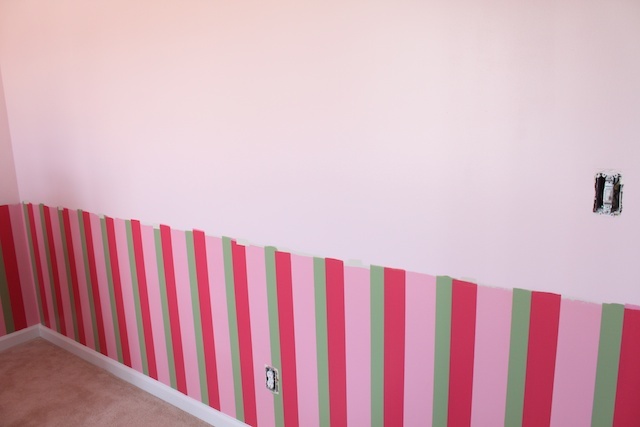 Use a foam board as guides to help tape straight and measure the distance between stripes. 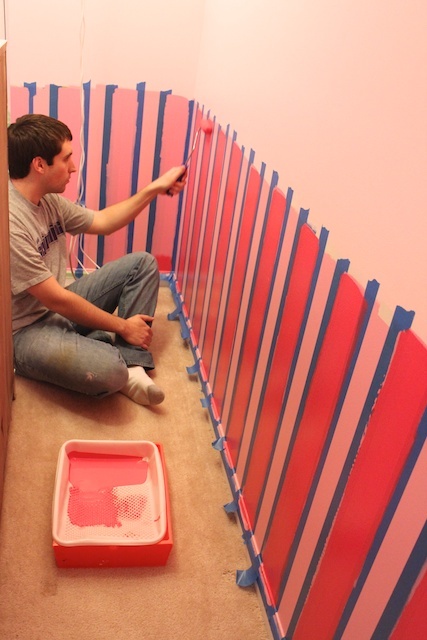 Pull the tape off as soon as you are done painting. 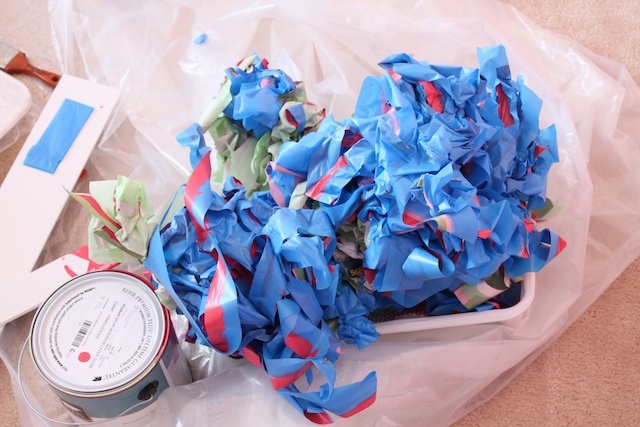 Don’t wait until the paint is dry because that increases the chance of the paint peeling off with the tape. Sketch out the pattern with the exact measurements on paper. Figure out how to put it up on the wall. I will be keeping you updated with the girls’ bedrooms as we keep progressing. And there will be some surprise reviles at the end. I’m getting super excited about this room. Until then, Nathan and I will be working like crazy to get this done to have our life go back to normal. » Tell me… Have you painted stripes before? How did you do it? Since I do a LOT of paining, I know that you guys put a lot of work into that. Making the wee people happy is well worth it, though! It is a design and color combination that can be used at any age. Love the color combination btw. Looks great! That scotch tape must be new since we painted last. . . . Great tip to take the tape off right away. Love the color choice. It looks great! I like the different sizes and color choice of the stripes. I wish I would have invested in the edge lock tape last time I did an accent wall. The walls here have a lot of texture and the paint bled pretty badly along the edges with normal tape. Love the striped painting. Can’t wait to see how the room looks in the end! I like the color of the stripes, it keeps it girly without being little-girlish, so it can grow with them. My husband used a level and drew the lines for the stripes lightly in pencil. Then I used a sponge brush and painted along the lines. I have a pretty steady hand and felt it would be faster overall than the tape and wait method. I used tape the next time I did stripes, though, when I made a gingham pattern for my friend’s daughter. Thanks for submiting this write up. This was the only three color striping writeup I could find. Followed your instructions and pictures and managed to create a nice bedroom for my son’s birthday surprise this past summer. Couldnt have done it without you! Thanks so much.